A slot car (sometimes, slotcar) is a powered miniature auto or other vehicle that is guided by a groove or slot in the track on which it runs. A pin or blade extends from the bottom of the car into the slot. 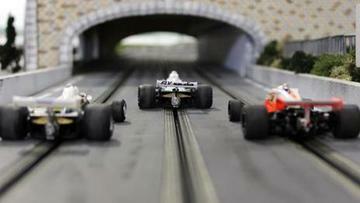 Though some slot cars are used to model highway traffic on scenic layouts, the great majority are used in the competitive hobby of slot car racing or slot racing.